I'm back today with another review for an iPad 2 case; the C.E.O. 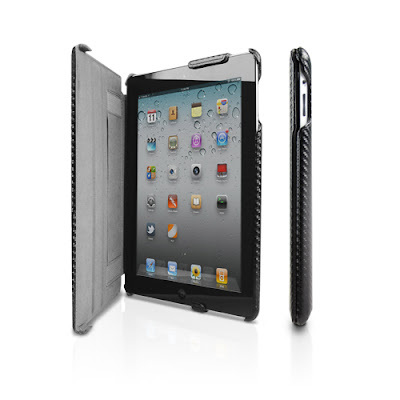 Hybrid iPad 2 Case by Marware . This particular case is like nothing I've reviewed before because it truly is a hybrid, mixing hard shell and soft interior with a unique 3 position stand design. You'll have to check my video review to see just how this case goes on, I think you'll find it interesting for sure. I've been quite happy with previous products reviewed by Marware , including the EcoVue iPad 2 Case I reviewed recently. This case is no exception. The unique design of the C.E.O Hybrid is what sets it apart from many others. The hard shell protection is a plus, along with the cool carbon fiber look that really gets peoples attention. You pull out your iPad 2 in public wearing this case and guaranteed you'll having people around here twisting their eye sockets to get a glimpse of this thing. The protection is good, the fit is like a glove and the looks are killer. If a hard shell/portfolio hybrid case is what you've been looking for, then I can totally recommend the Marware C.E.O Hybrid iPad 2 Case.A big shout out to Marware for sending this out to VH for review.